In the tradition of Hamilton and Angels in America, a powerful, politically charged, dystopian drama that couldn’t be more timely. Written in a “white-hot fury” on the eve of the 2016 election, the stunning new play by Pulitzer Prize– and Tony Award–winning dramatist Robert Schenkkan is creating a nationwide sensation. Bypassing the usual development path for plays, it has been signed up to open in five theaters across America in a National New Play Network Rolling World Premiere, starting in Los Angeles (March) and Denver (April) and continuing in the Washington, DC, area, Tucson, and Miami, with more productions to follow, including in Santa Fe and New York City. Building the Wall lays out in a harrowing drama the possible consequences of Donald Trump’s anti-immigration campaign rhetoric turned into federal policy. Two years from now, that policy has resulted in the mass round-up of millions of illegal aliens, with their incarceration overflowing into private prisons and camps reminiscent of another century. The former warden for one facility is awaiting sentencing for what happened under his watch. In a riveting interview with a historian who has come seeking the truth, he gradually reveals how the unthinkable became the inevitable, and the faceless illegals under his charge became the face of tragedy. 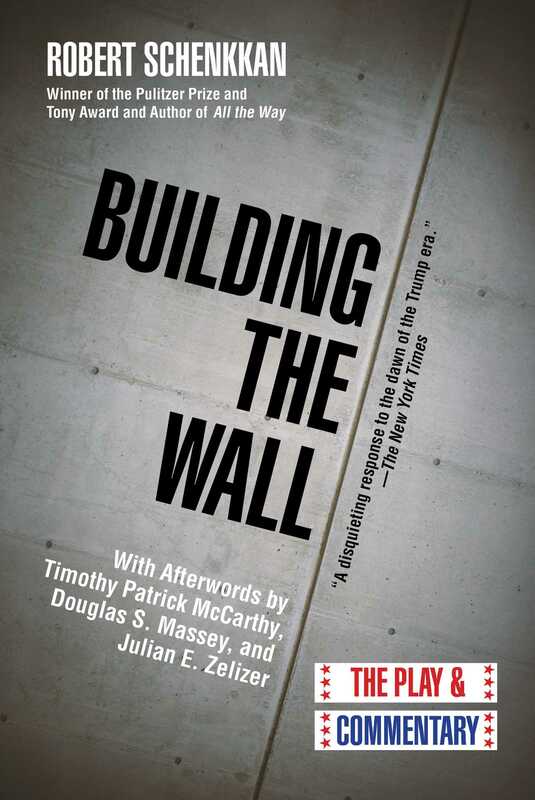 The play is accompanied by commentary from three prominent scholars: on the real purpose of the border wall, our dark nativist history of restricting immigration, and the tradition of political protest in art.